We would like to thank all Montreal owners for your support in 2017 and look forward to another special year for the Montreal and its owners in 2018. 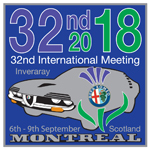 32nd Alfa Romeo Montreal International Meeting, Inveraray Scotland. 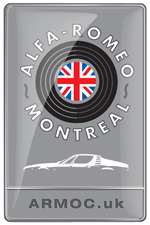 This is a NEW 105 production and is identical to the original Alfa Ricambi supplied gasket in every detail. Available in limited numbers and ready for immediate dispatch. 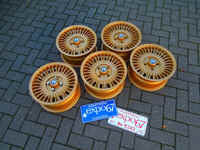 Please see the listing in our SERVICE PARTS section. 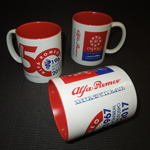 We have produced a limited number of Alfa Romeo Montreal Expo mugs for 2017 to celebrate 50 years since the Prototipo Montreal was exhibited at the Montreal Expo 67 World Fair in Canada..
PRICE: £8.95 Includes VAT - DELIVERY £4.95 includes VAT. To celebrate 50 years (Gold) we have had an original set of Montreal 14 inch Campagnolo magnesium wheels painted in Gold. These wheels will be fitted to our car whilst attending various events throughout 2017. 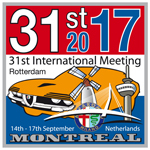 2017 will see the launch of a Montreal owners club for Montreal owners with cars registered in the United Kingdom.